Small independent villa situated close to the main Bus station and to all kind of amenities. With a nice private garden and swimming pool, this house has been built in two levels, and consist in two bedrooms, two bathrooms, living room with fireplace, separate dining room, fitted kitchen, nice covered porch and private parking. This one-plan-villa is located in a 25 year old established urbanization, just 2 min walk to the beach with its restaurants and promenade between Puerto Banus and San Pedro. This property has a matured landscaped garden with fruit trees, an ample 5 car parking place and a heated outside swimmingpool. Fully fitted wardrobes in all bedrooms, with special areas for hanging, clothes and drawers. There are fire places in the living room and the morning room. 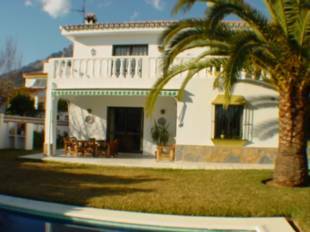 Villa located in one of the best areas of Marbella called “The Golden Mile”. Only 5 minutes walk to the beach, amenities and transport. South facing. Car port for 3 cars. Private swimming pool and garden. Two floors. Large storage room. Built in 1989. Residential area. Fully fitted kitchen. Satellite TV. Air conditioning in one bedroom. Marble floors. Entry phone. Safe. Fireplace. 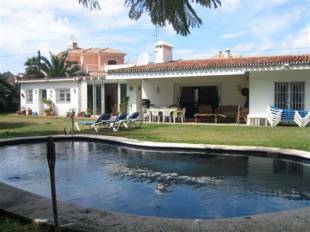 A well appointed south facing villa, between two excellent golf courses. 3 bedrooms, 2 bathrooms, toilet and laundry. The property also comprises of an open terrace, a covered terrace, private swimming pool and landscaped gardens with BBQ. Ample garage with space for 2 cars. Magnificent, recently built villa, offering excellent sea and mountain views, situated in a tranquil environment and enjoying a beautiful garden. No expense has been spared in the construction of this superb residence, which boasts a very individual style with all modern conveniences, including a lift from the impressive entrance hall up to the main living area on the first floor. Luxurious villa built in 2000. 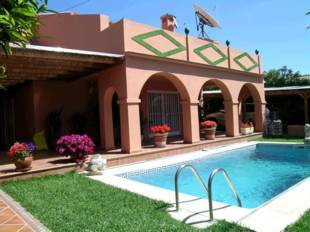 Located in one of the most beautiful prestigious and residential areas in Marbella. Garage for many cars. Built to a very high standard. Spacious rooms. Elegant main hall with 2 large staircases. Large snooker room. Only 2 minutes drive to Marbella centre. Private swimming pool in cascade with huge stunning gardens. Fantastic panoramic sea views and to Gibraltar. South facing. Under floor heating. Air con/heating. Alarm. Safe. Water tank. Guest toilet. Marble flooring.